Today marks the 34th Anniversary of the establishment of the Organization of Eastern Caribbean States. It was the day on which the Treaty of Basseterre was signed by seven countries in the capital city of the Federation of St. Kitts and Nevis. The Treaty was signed by Antigua & Barbuda, Dominica, Grenada, Montserrat, St. Kitts & Nevis, Saint Lucia and St. Vincent & the Grenadines. It is interesting in reviewing the historical record to discover that among the signatories to that historical project were political leaders as far ideologically and temperamentally apart as Eugenia Charles of Dominica and Maurice Bishop of Grenada. An eloquent enough testament to the fact that what unites us is far greater than that which divides us. One of the major intellectual authors and advocates of integration of the Eastern Caribbean was the Sir William Arthur Lewis who as far back as 1965 in the Agony of the Eight argued for a unification of these islands and the rationality of sharing costs and resources. Above all, Sir Arthur was always clear that integration was ultimately about THE PEOPLE, their happiness and their prosperity. Anniversaries like this provide us with an opportunity to assess and celebrate the accomplishments of the past recognizing that it is on the foundation of these accomplishments that the future is constructed. Build strong foundations that are deep and resilient and you can stand securely in the present and go higher in the future. Various Councils of Ministers – that now include Ministers of Health, Ministers of Social & Human Development, Ministers of Education, Ministers of Trade, Ministers of Foreign Affairs. The OECS Commission – the administrative arm of the OECS responsible for supporting and facilitating the work of the organs of OECS integration. The world in which we live today is a brutally competitive place with an uncompromising dominance of the large and the powerful. Our ability to navigate and survive like the proverbial straws is largely dependent on our ability to work to common purpose and forge a united will. Some of the foundations laid over the past 34 years now constitute some of the pillars of our resilience in the turbulence of today. The Eastern Caribbean dollar is holding its own, strengthened by the fact that it is not subject to the dictation of any individual member state but protected by the unanimity of all monetary authority members. This single currency is a tangible symbol of economic stability. There are others pillars of resilience that are almost invisible to the public but which impact all of our lives. For example the OECS Pharmaceutical Procurement Service which has centrally purchased quality medicines for public use at prices that represent savings of as much as 40% of the regular cost to governments. Another of these less visible pillars is the Regional Security System which we share with Barbados. The RSS has played an important role in security including drug interdiction across our waters but equally importantly in post disaster situations – the RSS is a first response mechanism for natural disasters in the OECS. We are now into the fourth year of implementation of the economic union and we have made comparatively good progress in this direction. All Protocol Member States currently have in effect the elements of free movement for OECS citizens which were agreed in 2011. The citizens of the OECS now enjoy an unencumbered right to move and live freely within the single space. We enjoy indefinite stay. Border officials accept any official photo ID other than passports. We have seen the removal of work permit requirements, the removal of means tests, and are now allowed the use of drivers licence from any national space to drive in host Member States. The policy on rights contingent to freedom of movement of people has been developed and is in the process of endorsement by Member States – this includes things such as seamless access to education for children, access to social and health services, ability to transfer all social benefits from your original home base to your new OECS location. In other words measures to ensure full enjoyment of everything that a citizen of that member state of your new domicile enjoys. The entry of Martinique to the fraternity of the OECS in this 34th year of integration marks a qualitative shift in our approach to regional integration. It signals the putting aside of the linguistic and cultural barriers that inhibited our embrace of each other. It opens new windows of possibility for people to people engagement, trade, exchange of services and the collective development of the region. As we move with optimism to the 35th Anniversary of the OECS, we are working with renewed vigor and optimism to putting in place the remaining elements that will truly make the OECS a single, seamless economic and social space. Consolidating the growth, development and free movement of goods, services, capital and ideas. This will involve initiatives such as a revitalization of the Eastern Caribbean stock exchange to facilitate the movement of capital and resources across the region; encouraging and strengthening indigenous and local capital accumulation mechanisms such as our credit unions and local banks. 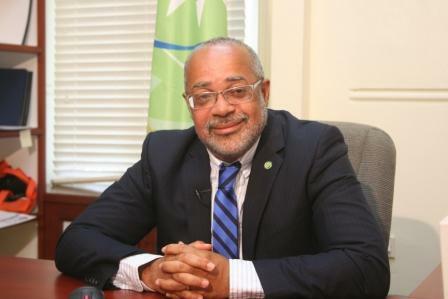 work is advancing on the single domestic space for travel via the proposed OECS border management and technical agencies integration project that will ultimately result in the abolition of the dreaded immigration card and make movement as easy as swiping an OECS smart ID card and walk through. We wish all citizens of the OECS a happy anniversary. Let us rededicate ourselves to this historical project with optimism in our potential and confidence in our ability.